Its use is strictly regulated and determined by the World Heritage Committee, with guidelines for its use defined in Chap. VIII + Annex 14 of the Operational Guidelines. It is protected under the international World Intellectual Property Organization (WIPO) act. The World Heritage emblem represents the interdependence of the world’s natural and cultural diversity. It is used to identify properties protected by the World Heritage Convention and inscribed on the official World Heritage List, and represents the universal values for which the Convention stands. Designed by Belgian artist Michel Olyff, it was adopted as the official emblem of the World Heritage Convention in 1978. While the central square symbolizes the results of human skill and inspiration, the circle celebrates the gifts of nature. The emblem is round, like the world, a symbol of global protection for the heritage of all humankind. 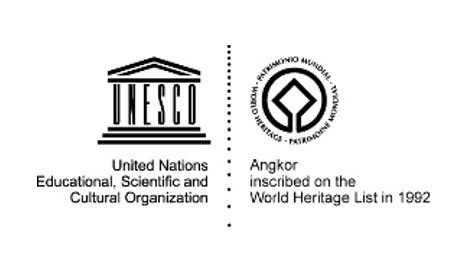 The UNESCO logo and the World Heritage emblem are UNESCO’s property. Theses logos are legally protected. UNESCO has the final authority to give permission for their usage. For rules concerning the UNESCO logo, please click here. For the World Heritage emblems and the related linked logos, the project has to be of direct relevance for the World Heritage Convention. 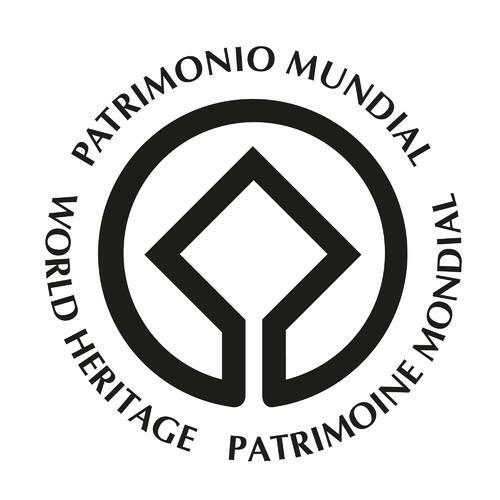 There are numerous possibilities to use the World Heritage emblems and certain linked logos (such as: World Heritage Committee sessions, patronage, publications, exhibitions, etc.). Site-specific logos and emblems can be used under certain conditions. It is not allowed to use the emblems and linked logos unless specific requirements are fulfilled. This must first be checked with the concerned National Commission. Potential approval of usage will depend strongly on the quality and content of the project, not on quantitative nor financial aspects. Commercial usage of the linked logos is not possible without a specific and official agreement signed by the Director-General of UNESCO. When commercial benefits are anticipated, the Secretariat and national authorities should ensure that the World Heritage Fund receives a fair share of the revenue. For further information, please refer to Chap.VIII and Annex 14 of the Operational Guidelines and the adjacent presentation. Before sending any request to UNESCO, it is necessary to consult via email well in advance with the National Commission for UNESCO concerned by the project i. e. the National Commission of the country where the activity/event will take place. Find the contact information of all National Commissions. 4. Requests the World Heritage Centre, together with the Advisory Bodies, to continue working with the Informal Working Group on the World Heritage Emblem in order to: 1. Prepare, if necessary, complementary guidance on the use of the World Heritage Emblem, including a draft table of uses of the Emblem; 2. circulate this guidance 6 weeks before the 36th session for consideration by States Parties and site authorities and seek their feedback; and 3. to report back to the 36th session of the World Heritage Committee on the progress made. 8. Expresses the wish that future budgetary documents include a distribution of all expenditures (including staff costs) between the main areas of activities (organization of meetings; preparation and assessment of nominations; conservation, management and monitoring of properties; capacity building activities and public awareness and support). c) Evaluate the contribution of PACT in developing partnerships at the local and regional levels in order to identify the possibility of establishing such partnerships at these levels, as well as the need to provide guidelines in this respect. 5. Requests the Director of the World Heritage Centre to report on new information pertaining to guidelines, procedures and visual representation of the UNESCO name and logo that may have a bearing on the conditions of use of the World Heritage emblem. Recalls the segment entitled ‘Responsibilities of States Parties’ of the Guidelines and Principles for the Use of the World Heritage Emblem as follows: ‘States Parties to the Convention should take all possible measures to prevent the use of the Emblem in their respective countries by any group or for any purpose not explicitly recognized by the Committee. States Parties are encouraged to make full use of national legislation including Trade Mark Laws’. 1. Requests the World Heritage Centre to provide a yearly report on the authorized use of the emblem to the World Heritage Committee in accordance with the Operational Guidelines (Annex 3 "Guidelines and Principles for the Use of the World Heritage Emblem" July 2002). Decides that the proposed World Heritage Visual Identity will not be included on the agenda for the 27th session of the World Heritage Committee (Suzhou, June/July 2003). 4. Invites the Director-General, when the auspices of the World Heritage Committee and the World Heritage Emblem are requested for an international conference or congress, to submit the concept and the draft programme to the Committee for its approval. 2. Decides to postpone the discussion on the manual and visual identity to its 27th session in June/July 2003. 8. Welcomes the proposal to develop performance indicators for evaluating the Initiative for consideration by the Committee in 2003 and to submit progress reports, and invites the Director-General to submit to the Committee at its 30th session in 2006 an evaluation of the Initiative up to end of 2005. XIV.1 The Chairperson then introduced Agenda item XIV concerning Awareness Building and Education Activities and, due to lack of time, asked the Committee to accept reviewing the work plan of activities proposed in document WHC-01/CONF.208/17 without hearing the Secretariat's presentation on this item. XIV.2 The delegates demonstrated their support for the communication strategy in developing awareness activities and reiterated their unyielding support to activities such as the World Heritage Education project for Young People. It was suggested that activities in this programme also include awareness-raising with regard to wilful destruction of heritage. The importance of involving universities in research and training was also stressed. XIV.3 Questions were raised concerning specific activities proposed in the work plan, notably on the World Heritage Review and the new series of World Heritage Papers being proposed and underlined the need to ensure better co-ordination of these activities with other partners, including the Advisory Bodies, in order to strengthen the impact of these projects and avoid any duplication of efforts. The issue of quality control was also raised and the Centre was invited to consult with States Parties concerned before information materials are produced and used in promotional contexts, particularly with regard to the public service announcements under preparation. XIV.4 The Committee debated on the proposed World Heritage Visual Identity and the need to examine this document more closely as similar initiatives may have already been undertaken at local and national levels and new information may be derived from existing experiences. The need to keep this new tool as flexible as possible and to take other visual identities designed by local management authorities into consideration was also emphasized. The design of the new World Heritage signature, illustrated in the draft Visual Identity manual, was considered positively, provided that a certain measure of flexibility be given to management and national authorities for the choice of language versions attached to this Signature as stipulated in the Guidelines and Principles for the use of the World Heritage Emblem contained in the Operational Guidelines. It was suggested that the current draft manual on the proposed World Heritage Visual Identity could be circulated to the members of the Committee for comments and that a new draft should be prepared for examination at the next session of the Bureau in April 2002. This proposal was approved by the Committee. XIV.5 Following the comments made by delegates on this item, the Committee decided to approve the proposed work plan of Awareness-Building and Education activities. In addition, the Committee requested the Centre to study the process for ensuring the legal protection of the World Heritage Emblem and report on its findings during the next session of the Bureau. IX.32 The Secretariat briefly introduced the issue on the use of the World Heritage Emblem and Fund-raising, by recalling the step by step process followed by the Consultative Body in proposing new Guidelines on the Use of the World Heritage Emblem and Fund-raising to the Committee at its twenty-second session. The Secretariat further recalled that the document submitted to the Committee for examination within document WHC-98/CONF.203/11Add remained unchanged since it was last presented to the extraordinary session of the Bureau. IX.33 Concerning the use of the World Heritage Emblem, the Chairperson recalled discussions of the twenty-second extraordinary session of the Bureau and invited the Delegate of Canada, who had suggested amendments to the Guidelines prepared by Japan and the United States of America, to present them. IX.34 In presenting the proposed document, "Guidelines and Principles for the Use of the World Heritage Emblem", the Delegate of Canada informed the Committee that the proposal emanated from the Guidelines prepared by Japan and the United States of America (WHC-98/CONF.203/11Add) and was finalized in co-operation with these delegations. She underlined the fact that the document was not a new proposal, but a slightly modified version of the Japanese/USA Guidelines, presenting a more concise, but nevertheless self-contained document. She recalled that the adoption of the proposed Guidelines and Principles would entail a revision of the Operational Guidelines for the Implementation of the World Heritage Convention. She concluded by stating that, after having spent close to two years working on this issue and in view of the growing urgency of the matter, the Committee should adopt guidelines to provide all concerned parties with a tool ensuring appropriate use of the Emblem. IX.35 While recognizing that the proposed Guidelines reflected the comments of the Secretariat to some extent, the representative of the UNESCO Publishing Office who participated in the debate, expressed reserve regarding the applicability of the Guidelines and quality control requirements proposed in the document. He stated that this might discourage media related companies (publishers, film producers, etc.) from requesting the use of the Emblem on World Heritage related information products. IX.36 During the discussions, concerns were raised on the legal aspects related to the protection of the Emblem and the implications of these aspects in terms of the responsibilities of the Committee and the States Parties to the Convention. The need for quality control of World Heritage site-specific products from States Parties was reaffirmed and considered indispensable. IX.37 A working group, composed of the Governments of Australia, Canada, Italy, Japan, Thailand, the United Kingdom, and the United States of America was established on a voluntary basis to continue working on this issue before the end of the session. The working group made amendments to the text to reflect the discussions of the Committee. The Delegate of the United States of America briefly presented the modifications made to the document. This new version of the document (attached as Annex XII to this report) was adopted by the Committee. IX.38 The Chairperson briefly introduced the Fund-raising Guidelines and reminded the Committee that the "Internal Guidelines for Private Sector Fund-Raising in Favour of UNESCO" have been in use within UNESCO since 1997 but have not yet been adopted by the Executive Board. Therefore, the Chairperson proposed that the Committee ask the Centre to work in accordance with the "Internal Guidelines for Private Sector Fund-Raising in Favour of UNESCO". The Committee agreed with the proposal and then adopted the decision as formulated. V.6 The Committee decided to prolong the work of the Consultative Body, to be chaired by the President of the World Heritage Committee, Professor F. Francioni (Italy). The Delegate of Australia stated that the Director of the Centre should also be closely involved in the work of the Consultative Body. It was decided that the Consultative Body would report initially to the twenty-second session of the Bureau and then to the twenty-second session of the Committee. The Committee asked that the Consultative Body analyse the Management Review Report, further study the use of the emblem and fund-raising guidelines and investigate the balance between the Centre's work on promotion compared to that on the management of World Heritage properties. XII.16 With regard to partnerships with the media and publishing houses, the Committee expressed concern about the use of the emblem and quality control The Committee requested the Consultative Body to submit to it recommendations on the use of the emblem and guidelines for fund-raising. This would allow the development of a policy for outside partnerships that the Centre would implement. The Delegates of China and Japan commended the efforts of the Centre in building partnerships with the media, stating that in their countries World Heritage films produced by Beijing Television and Tokyo Broadcasting System (TBS), respectively, has been diffused widely, informing large audiences of the importance of World Heritage. The delegate of Japan stated that more than half of the income from media contracts come from Japanese companies, showing how despite the late accession of Japan to the Convention, there is a tremendous public interest in World Heritage which is inspired by the media. 1. Under Section A. the Committee agreed not to approve the request for the purchase of equipment under A.7 and A.8 from the World Heritage Fund as a matter of principle, indicating that equipment to be used by the Secretariat should be financed under the Regular Programme Budget. The Committee therefore decided to allocate US$ 38,000 from the World Heritage Fund for 1998 for the documentation. 2. Under Section B, the Committee decided to allocate US$165,000 from the World Heritage Fund in 1998, but requested the Secretariat to submit a proposal on means of cost recovery for posters, maps and other material being produced under this section as well as the possibility of co-production of such material for mass distribution. 3. Under Section C, taking into account the comments of several Committee members on the need to use the radio medium, the Secretariat was requested to prepare a strategy and plan of action on how to support States Parties efforts to produce radio programmes on World Heritage. The Committee decided to approve the budgetary ceiling of US$ 70,000 for Section C, stating that up to US$ 20,000 can be used to prepare a strategy on radio programming instead of the proposed activity C.5. 4. Under Section D, the Committee decided to allocate US$ 10,000 to be used to promote the involvement of publishing firms and national television companies in developing countries, in addition to the earmarked income for servicing generated from contracts with the media partners to enable the Secretariat to employ consultants and issue fee contracts for backstopping the contracts and carrying out content validation of the World Heritage information products being produced by the partners. XII.19 To enable the Committee to address outstanding issues related to information activities, notably on the guidelines on the use of the World Heritage emblem for information and the private sector fund-raising activities, as well as on content validation, it was decided that the Consultative Body would continue its work and submit its recommendation to the Bureau in June 1998 and to the Committee at its twenty-second session. It was agreed that the Consultative Body would also look into the information strategy especially with the view to improving the target of the various information material being produced by UNESCO as well as by the media partners. XII.29 It was suggested that the project also involve tertiary education and work in association with the Culture Sector of UNESCO which has already been involved in projects relating to heritage protection and universities .The Committee approved a total amount of US$ 70,000 for the Young People's World Heritage Education Project in 1998. The Chairperson closed the debate by noting that the Committee had expressed wide praise and enthusiasm for the Project. * US$ 226,333 earmarked income for servicing fee received from the media and publishing partners. ** including US$ 30,000 from the Education Sector. XV.1 In introducing this agenda item on promotional and educational activities carried out in 1996 and to examine the proposals for 1997 (as contained in Document WHC-96/CONF.201/16), the Chair stated that these activities play a vital role In enhancing the implementation of the Convention and that the Committee therefore attaches great importance to these matters. She explained to the Committee that the World Heritage Centre, in addition to managing such activities financed from the World Heritage Fund, also coordinates promotional and educational activities on World Heritage carried out by other sectors of UNESCO and implements activities in this field entrusted to the Centre by the Director-General of UNESCO. XV.2 The Chair requested the Secretariat to focus its presentation on the 1997 proposed activities on the assumption that the Committee has noted the activities carried out in this field in 1996 as reported in the above-mentioned document. XV.3 The Secretariat began its presentation by responding to the request from one of the members of the Committee for a clarification on the notion of promotional activities, as understood by the Centre. The Secretariat stated that promotion was not to be confused with public relations and marketing but refers to information and communication activities for the enhancement of understanding and support by the public of the World Heritage Convention and their participation in its implementation. XV.4 Towards the attainment of these objectives, and in the furtherance of one of the principles of UNESCO which is to provide access to information by as large a sector of the world population as possible, the information and communication strategy of the proposed programme is to produce basic core information that is adaptable and could be expanded for different target groups. XV.5 The Secretariat explained that the proposed programme aims to optimize limited financial and staff resources, and to meet the needs of these different target groups, ranging from political decision-makers; business sector, including tourism; teachers and students; local communities inhabiting in or near the World Heritage sites and to the general public at large. XV.6 The Delegates of Germany and the United States of America commended the excellent quality of the document and the clarity of the Secretariat's presentation, and congratulated the Director and the staff of the Centre for their accomplishments in this field. XV.7 Several members of the Committee raised serious concerns over the numerous errors contained in the CD-ROM on World Heritage Cities co-produced by UNESCO and produced by the media with the use of the World Heritage emblem and insisted upon the need for quality control. The Committee felt that UNESCO should share the text of the publications and films with the States Parties concerned for verification in conformity with the Operational Guidelines. A delegate drew the Committee's attention to the question of confidentiality of Committee documents on Internet. XV.8 Several members of the Committee also stated that UNESCO had not always respected paragraph 125 of the Operational Guidelines, regarding the commercial use of the emblem. In this respect the Delegate of Italy stated that the Operational Guidelines for the Implementation of the Convention should be closely abided to, and in particular paragraph 125, which does not authorize commercial reproduction of images of World Heritage sites. It was emphasized that on the contrary, the paragraph required that the State Party concerned be consulted before dissemination of information and images (even non-commercial) in order to avoid errors. In any case, it is necessary to verify that the intellectual property rights of each country are protected. XV.9 With reference to the wide diffusion of documentary information mentioned by the Delegation of Germany, the Delegation of Mexico wished to express the surprise of their authorities at the Ministry of Public Education who had finalized the publication of a book on Mexican sites inscribed on the World Heritage List, when discovering the commercialisation of a publication on these same sites, without forewarning or prior authorization, in another country and which moreover contained important errors, especially with regard to the illustrations. Consequently, the Delegation of Mexico requested that the States concerned be systematically consulted regarding all publications and proposed: (a) the use of information (often already available at the World Heritage Centre) in coordination with States; (b) that States be provided with advance information regarding publication programmes to avoid legal problems at the level of individual States and therefore maintain the credibility of the Convention. Many members of the Committee stated the need for the Secretariat to bear in mind the information requirements of developing countries and local communities which often do not have access to telephones, much less the Internet. The importance of the print and radio mediums for information dissemination was stressed. XV.10 As regards World Heritage Education, the Secretariat recalled that the World Heritage Centre initiated in 1994, jointly with UNESCO's Education Sector, a project aiming at introducing knowledge about World Heritage in secondary schools worldwide, primarily through UNESCO's network of Associated Schools. Its main purpose is to empower local people to protect their cultural and natural heritage by helping them understand the Convention, and by having them actively involved in local/national preservation efforts. XV.11 The project focuses on working regularly with students, teachers and specialists (curricula developers and conservation specialists) in developing a World Heritage Education Kit (consisting of a manual, texts, visual and audio material) which should help teachers "translate" the Convention into the language of their students, and raise the students' awareness about cultural and natural heritage in general. The first parts of this kit, produced on an experimental basis, have been tested through UNESCO's (sub) regional World Heritage Youth Fora which followed the First Forum held in Bergen in 1995, namely: (a) the European Forum held in Dubrovnik in May 1996, and (b) the Forum for countries of English-speaking and Portuguese-speaking Africa, held in Victoria Falls, Zimbabwe in September 1996. Further work on the material, in collaboration with ICOMOS and IUCN will take place in 1997, and this will be tested during the fora to be held in Asia and the Pacific, the French-speaking countries of Africa, the Arab States and Latin America and the Caribbean in the next two to three years. XV.12 The main institutional partners for this project in each country are the UNESCO National Commissions, ICOMOS and IUCN chapters (as resource persons) and teachers' associations. The project is receiving major financial support from the Rhone Poulenc Foundation and NORAD (both contributions go to a Special Account within UNESCO, earmarked for this project) and is being carried out with assistance from UNESCO Field Offices and other units of the Secretariat. XV.13 In the ensuing debate, many of the members of the Committee expressed their full support for the World Heritage education work that is being done. Some stressed however the importance of assuring follow-up activities to the World Heritage Youth Fora. XV.14 The Director of the Centre in responding to the comments and concerns raised by the Committee stated that the Centre is trying to ensure the quality of the multimedia information products by employing experts to check on the text from the servicing fees provided through contractual agreements with the media and publishing partners. The amount already received in the first ten months of the year has permitted this in addition to a full- time consultant working at the Centre to negotiate with media partners and to provide them with the logistic support as defined in the contract. He indicated that the costs for one full-time consultant for backstopping the media and publishing partners for 12 months, one expert to revise the German-language products for 6 months and one expert to revise the English-language material for 3 months have been paid from the servicing fees from these contracts. XV.15 The Director was requested by the Chair to respond to the following questions related to this agenda item raised by members of the Committee during the examination of the 1997 budget. (d) whether a marketing strategy is needed and if so, whether this would be in keeping with the rules and regulations of the Committee. XV.16 The Director stated that the income received from the contracts between 1 January and 31 October 1996, amounted to US$ 94,437 as servicing fees (entered into the accounts as earmarked contribution) and US$ 132,787 as contribution towards the Fund for use to be determined by the Committee. He specified that this amount does not take into account the share on incomes retained by the UNESCO Publishing Office (UPO) or other entities of UNESCO which also conclude contracts related to World Heritage. XV.17 He explained that income in 1997 will most likely increase but that he was not in a position to provide the amount since much of the income comes from percentages on royalties which of course depends on the sales. XV.18 The overall strategy and programme was approved, with the exception of the proposed budgetary appropriation for the 25th anniversary (US$ 100,000) and the State of the World Heritage Report (US$ 35,000). XVI.1 The Secretariat summarized Working Document WHC-96/CONF.201/17 on the "Use of the World Heritage Emblem" which was requested by the twentieth session of the Bureau in 1996, and which provided a legal analysis by UNESCO's Legal Advisor of the aspects concerning the use of the emblem, as well as proposals as to the manner in which to guide its appropriate use. The legal analysis determined that under the terms of the contract with the artist, Mr. Olyff, who designed the emblem, the owner of the emblem is UNESCO. However, it was further underlined that the Committee adopted the artwork as the emblem of the Convention at its second session in 1978, and had developed guidelines for its use as represented in the Operational Guidelines, paragraphs 122-128. The Secretariat explained that the situation was multifaceted and complex as well as not sufficiently addressed in the Operational Guidelines to assure the consistent and timely authorization of the use of the emblem. The Committee emphasized that it had previously decided that the States Parties had the responsibility to control the use of the emblem within their sovereign territories and it was observed that two States Parties (Canada and the United States of America) had taken the necessary steps to regulate and control the use of the emblem. The non-commercial and commercial, educational, informational, promotional and presentational uses of the emblem were noted as difficult determinations to make in the absence of more detailed guidelines. While the prerogative of the Committee to make such determinations on a case by case basis is recognized in the Operational Guidelines, pragmatic considerations for the use of the emblem had led the Centre to make for educational purposes with the private and public sector media contractual arrangements which have generated contributions to the World Heritage Fund. The Centre sought additional guidance from the Committee with respect to the development of criteria for the consistent and appropriate use, regulation and protection of the emblem. 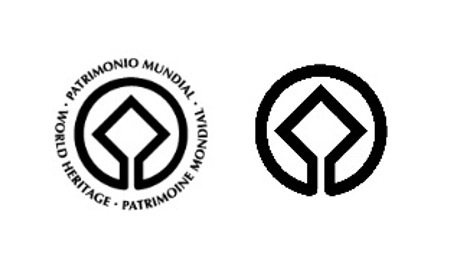 XVI.2 It was brought to the attention of the Committee that in the current Operational Guidelines, the use of the term World Heritage "emblem" was recommended, but that the term "logo" also appears. For consistency and to avoid a nomenclature that implied a commercial connotation it was suggested to use in the future exclusively the term "emblem". It was recommended that the Committee considers revising the Operational Guidelines accordingly. XVI.3 The Delegate of Lebanon concurred with a consistent use of the term "emblem" throughout the Operational Guidelines and the equivalent in the French text. He further expressed the opinion that UNESCO had not respected the procedures for the use of the emblem. The Delegate of Malta welcomed the confirmation from UNESCO's Office for International Standards and Legal Affairs that the decision to adopt the design as the emblem of the Convention could only be taken by the Committee, and that UNESCO can only dispose of it through the Committee. Therefore, Article 6 of the Agreement between UNESCO and the Government of Norway was legally problematic. The Committee believed that the development of more detailed guidelines for the use of the "emblem" was necessary and that the abusive commercial use of the "emblem" should be avoided. XVI.4 The Committee decided to place this question on the appropriate use and authorization of the World Heritage emblem before the Consultative Body created by the Committee for the purpose of reviewing the financial and management aspects of the Centre. 30. The Secretariat informed the Committee that it had carefully explored the various means available to protect the emblem and the name of the World Heritage Fund. Nations party to the Convention should take all possible measures to prevent the use of the emblem of the Convention and the use of the name of the Committee and the Convention in their respective countries by any group or for any purposes not explicitly recognized and approved by the Committee. (c) to accept the proposal from Upsala Ekeby as set out in the Annex to document CC-79/CONF.003/6.1, authorizing the firm to use the World Heritage Emblem and the name of the Convention on a series of silver spoons and the glassware, subject to the stipulation formulated in paragraph (b) above and on condition that the company was not given exclusive rights to use the emblem and the name of the Convention on articles of the type proposed; it is however understood that the company will retain exclusive rights on its own design as foreseen in international agreements on the protection of industrial property. The question was raised as to whether the Committee would authorize States Parties to the Convention to produce material bearing the Emblem such as postage stamps and postcards for publicity purposes and for raising financial contributions to the Fund. The Committee was of the opinion that States Parties were free to use the Emblem for such purposes, and could make additional voluntary contributions to the Fund by this means.